With things constantly evolving in marketing, keeping up with the latest developments can feel like a full-time responsibility. That’s why we publish materials and resources that help you navigate the ever-changing marketing landscape. We want you to gain insights needed to drive results. Here’s a list of our most popular eBooks. These serve as excellent references on various areas of modern B2B marketing—from how-to guides and best practices, all the way to industry trends and benchmarks. So, browse through the selection and dive into a topic you like or include all titles into your reading list. These hot reads will help you become a better B2B marketer. Not all leads are created equal. At any given moment, some leads are more qualified and sales-ready than others, while some will never become your customers. Assigning lead scores helps you manage and engage leads effectively. But, as the buying cycle becomes ever more complex, traditional ways of scoring and ranking leads are now starting to grow obsolete. This eBook is a short primer to predictive lead scoring. Predictive lead scoring greatly extends what lead scores can do, and this guide teaches you everything you need to know to start using it in your marketing program. 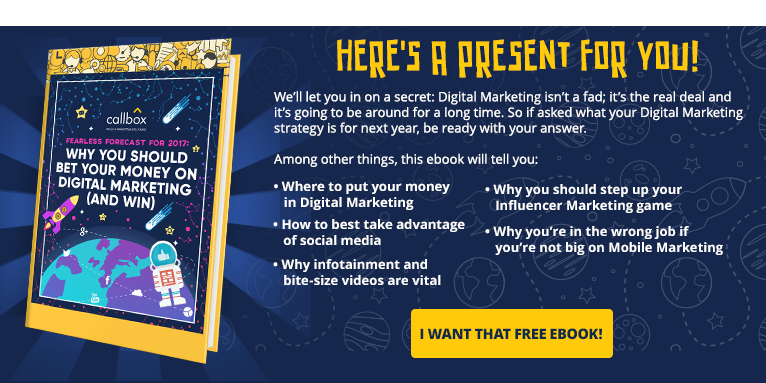 If you’re still holding out on digital marketing for some reason, this eBook will change your mind. Packed with real-world trends and statistics, this guide builds a solid argument for developing and executing a digital marketing strategy right now. This whitepaper shows the value that digital marketing delivers. It talks about which tactics to focus on for different business stages and strategic goals. Most importantly, this guide helps you build a winning digital marketing strategy from scratch. Modern B2B lead generation can feel overwhelming and daunting to even the most experienced marketers. There’s simply too much in the way of information, tools, tactics, and strategies. This latest edition of our lead generation kit untangles the complexities in the art and science of acquiring leads. It’s a step-by-step guide to building a fully-functioning lead generation engine. With this eBook, you’ll learn the lead generation process and the role that each lead-generating channel plays, as well as how to tie everything together with the right platform and people. Your website and landing pages are excellent sources of qualified leads. But it takes the right balance between content and design to maximize web conversions. With the 15 web design practices cited in this eBook, you’ll be able to boost the number of leads generated from your web traffic. The 15 practical tips have been hand-picked based on solid science and concrete results, focusing on various design elements that influence conversions. Writing email copies for B2B sales takes up time and resources that are better spent elsewhere. To save you the trouble of crafting compelling sales emails, we’ve compiled 40 ready-to-use email templates in this downloadable PDF. These 40 templates include emails for cold outreach, following up, lead nurturing, influencer marketing, and other situations that require email communications. These are proven email copies that have generated very good open rates, CTRs, reply rates, and conversions. 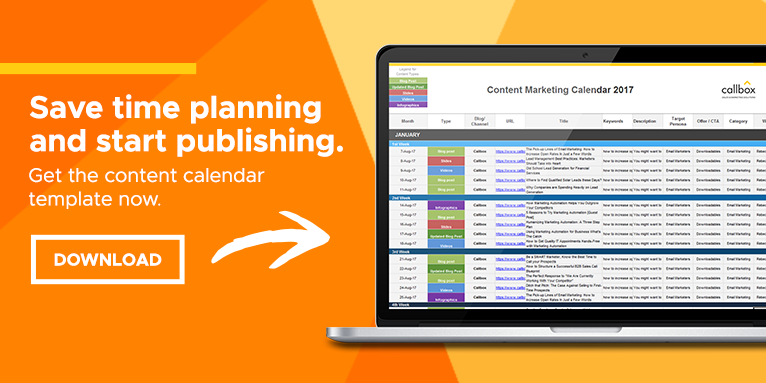 Content calendars translate your content marketing strategy into a workable plan. It’s a crucial component of any modern marketing program. Without it, you’re part of the 34% of marketers who don’t have a documented content marketing plan. This downloadable content calendar template saves you the trouble of creating one from scratch so that you stay focused on producing compelling content. Although we’re already well within 2018, this eBook remains a valuable reference for marketers in the software and technology space. There’s still plenty of insights and ideas that the previous year can teach us. We compiled this eBook by digging into more than 60 industry reports, selecting numbers that matter in planning and strategy development, and organizing the stats into 35 actionable insights. Rebecca is the Business Development Executive at Callbox. She spearheaded successful projects in leveraging brand visibility. A vivid marketing blogger and a goal-oriented leader who enjoys sharing tips and stories. 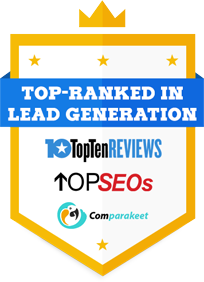 Monthly Top 5 List: Tips for Startups to Generate Leads without a Website Callbox Gets a Nod from Comparakeet!